Peptide (C)KDDKDFTGTIHRID, corresponding to amino acid residues 193-206 of rat KV1.1 (Accession P10499). 1st extracellular loop. Homology Mouse - identical; human - 13/14 amino acid residues identical. Standard quality control of each lot Western blot analysis (unlabeled antibody, #APC-161), and immunocytochemistry (labeled antibody). Immunohistochemical staining of perfusion-fixed frozen mouse brain sections using Anti-KV1.1 (KCNA1) (extracellular)-ATTO-594 Antibody (#APC-161-AR), (1:100). 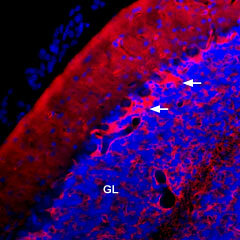 KV1.1 (red) is detected in the granule layer (GL) and pinceau structures (arrows). Cell nuclei are stained with DAPI (blue). Cell surface detection of KV1.1 in live intact rat PC12 pheochromocytoma cells. 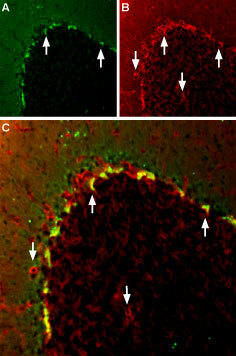 A. Extracellular staining of cells with Anti-KV1.1 (KCNA1) (extracellular)-ATTO-594 Antibody (#APC-161-AR), (1:25), (red). B. Live view of the cells. C. Merge of A and B.
Baumann, A. et al. (1988) EMBO J. 7, 2457. Gutman, G.A. et al. (2005) Pharmacol. Rev. 57, 473. Adelman, J.P. et al. (1995) Neuron 15, 1449. Bogin, O. (2006) Modulator 21, 28. KV1.1 channels are sensitive to low doses of TEA (0.3 mM) and 4-AP (0.29 mM), the “classical” non-selective potassium channel blockers. Anti-KV1.1 (KCNA1) (extracellular) Antibody (#APC-161) is a highly specific antibody directed against an epitope of the rat protein. The antibody can be used in western blot, immunohistochemistry, indirect flow cytometry and live cell imaging applications. It has been designed to recognize KV1.1 from human, rat and mouse samples. Anti-KV1.1 (KCNA1) (extracellular)-ATTO-594 Antibody (#APC-161-AR) is directly labeled with an ATTO-594 fluorescent dye. ATTO dyes are characterized by strong absorption (high extinction coefficient), high fluorescence quantum yield, and high photo-stability. The ATTO-594 fluorescent label belongs to the class of Rhodamine dyes and can be used with fluorescent equipment typically optimized to detect Texas Red and Alexa-594. Anti-KV1.1 (KCNA1) (extracellular)-ATTO-594 Antibody is especially suited for experiments requiring simultaneous labeling of different markers. Anti-KV1.1 (extracellular) Antibody (#APC-161), (for western blot analysis). This antibody recognizes a different epitope and thus can also be used as a control for detecting KV1.1.